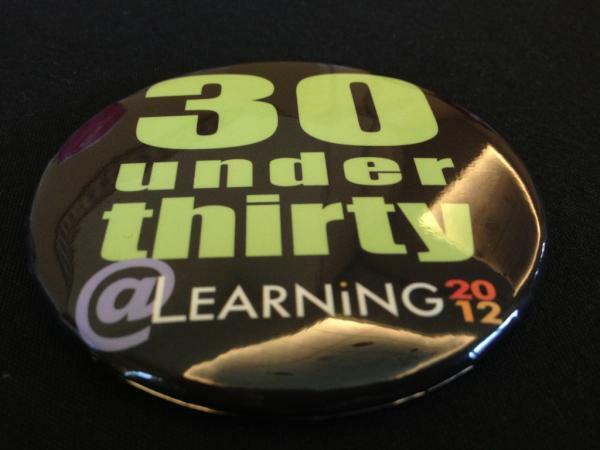 When I attended Learning 2012 last month, I was lucky enough to be there as part of 30 Under Thirty: a group of 30 ‘future leaders’ in learning and development. Actually, there were 32 of us in the end: Elliott explained that he usually expects a few to drop out so overfills the spaces; that didn’t happen this year but contrary to his on-stage threats at the opening session, the audience didn’t vote on which two of us to evict and we all survived the week! Although 30 is a fairly arbitrary cut-off age, I think the concept is a good one. I thought I’d share some of the 30 Under Thirty experience, as well as what I got from it. What was the 30 Under Thirty experience? Our conference started ahead of time, with a private online networking space so we could start talking and planning for the conference. Some of the conversations were just getting-to-know-you chit-chat, but there were also some more professionally-relevant threads about what makes an online community successful or our greatest frustrations about workplace learning, for example. The week before heading to Orlando, we were also given some prep work: three questions to think about and answer (via email) in three words or less. I’m actually saving those questions (and our answers) for a separate blog post, but we used them as a starting point for some discussions on the first day of the conference. As the hotel and conference suite began filling up with people checking-in, catching up and exploring, our 30 Under Thirty group was kicking things off with a lunchtime welcome session. Bob Baker, Emily Fearnside and Nigel Paine introduced themselves and the programme, and went on to be wonderful organisers and guides throughout the week. Over lunch, we each introduced ourselves, our background and our hopes for the conference. And Elliott dropped by to chat to us, opening himself up for a no-holds-barred Q&A and sharing some motivational words to encourage us to get the most from the experience. He later hauled us all up on stage at the opening session so we could collectively introduce ourselves. This lunch-and-learn approach really became the model for our extra conference experiences. Each morning at breakfast, we were joined in our little room by one of the conference speakers, and again at lunchtime. Being able to chat more informally to people like Jenny Zhu, Richard Culatta and Lisa Pedrogo was great, in terms of both delving a little deeper into the topics of their sessions and seeking advice for forging successful careers. None of these sessions were mandatory, but we had pretty much a full house for each one, so it’s safe to say that we all felt they were worth the early start every day! On the first full day of the conference, we became ‘reverse mentors’ for an hour. Anyone at the conference – provided they were over 30 – could turn up to do some speed mentoring with us under-30s. It was fairly fluid and unstructured: apart from the facilitator with a timer telling us when it was time to find a new partner, there weren’t really any ‘rules’. Interesting conversations were had all round, although not necessarily about the things I’d expected. Thinking about the reverse mentoring in advance, I’d anticipated conversations about designing learning for younger generations coming into the workplace, or other learning-focused topics. In fact, the majority of the conversations I had or heard were about young people in the workplace more generally – our drivers, ambitions and ways of working. I had a really interesting conversation about what I look for in a manager, in colleagues and in an organisation and how this might affect or be affected by the move away from a job-for-life culture. I wasn’t personally involved in any real-time sessions (which I explained in an earlier post), but many of my 30 Under Thirty colleagues helped facilitate these or other, scheduled sessions throughout the conference. And our super-sized badges were designed to be an invitation for anyone to stop and chat to us, so the programme really did run across the entire conference for us. A few of us were called back up on stage on the final morning at the closing session to highlight some of our key takeaways, and the experience is set to continue beyond Orlando with LinkedIn discussions and a series of lunch-and-learn webinars in the pipeline. What did we – and I – get from it? ‘Ask for forgiveness, not permission.’ More than one of our guest speakers offered this advice and, while it’s not necessarily a philosophy to work by all the time, I hope that hearing this from people who are equivalent to our bosses (or our bosses’ bosses!) will encourage us to be a little more adventurous. ‘You are your own CEO.’ We were reminded that we need to drive our own development and take responsibility for our own brand and profile. Hearing this from people such as Lisa Pedrogo and Brian Poland, combined with the inspiring story of what Jenny Zhu has achieved before turning 30, was a powerful message. ‘Understand the business.’ There wasn’t a single sound-bite to summarise it, but this message came through loud and clear in so many ways. In terms of both personal career development and the impact or effectiveness of learning teams, getting under the skin of and understanding different parts of the business was the top tip. ‘If you’d like a mentor, ask.’ Mentoring was another of the hot topics amongst the 30 Under Thirty, endorsed by Nigel, Bob and Emily as well as other guest speakers. The main advice here was to make it happen: if someone seems like a good fit for you, approach them with what you’d like to achieve – don’t wait for someone to come to you! Being part of 30 Under Thirty was a positive experience for me in another way on a more personal level. There were around 1600 people attending Learning 2012. It was busy, it was crowded and it was loud! I enjoyed having the option of retreating to a group-within-the-group, both at scheduled times and more informally. I’m not sure if this will come across quite as I mean it, but 30 Under Thirty anchored me, and gave me a sense of belonging from day 1, which I probably take for granted now at UK conferences but which I would definitely have otherwise missed at my first US ‘super-conference’. Of course, the experience isn’t over – and that’s another of the benefits of 30 Under Thirty. We’re all connected on LinkedIn and Twitter, and discussions are already cropping up or continuing from the conference. Plans are being made for coffees and catch-ups as people pass through each other’s cities, and a series of Google Hangouts and lunch-and-learn webinars are being scheduled. This is probably the most valuable thing of all to come out of 30 Under Thirty: the new relationships that were formed and will be cemeted over the coming months. This entry was posted in Learning and training and tagged collaboration, conference, learning, lrn2012, social media on November 12, 2012 by Stephanie K.